The Gorkha Janmukti Morcha today brought out a rally to press for the inclusion of 11 communities in the Scheduled Tribe list but Trinamul quickly alleged that the Morcha, along with the BJP, was playing with the sentiments of hill people. The prompt response of Trinamul suggests the tribal-status issue, along with granting of land rights for tea garden and cinchona plantations inhabitants, is likely to take centre stage for some time now. The rally, organised by the Yuva Morcha, started from the Darjeeling Motor Stand and culminated at a street corner meeting at Chowrasta in Darjeeling today. Priyabardhan Rai, the Yuva Morcha general secretary, said: "We demand that the 11 communities must be granted tribal status as early as possible. We are planning to hold similar rallies in other parts of the hills soon." But within two hours of the rally, Sharda Subba Rai, who was the Darjeeling Trinamul candidate in the recently concluded Assembly election and a senior party leader, called a news conference and slammed the Morcha and the BJP. "On May 25, the Union cabinet chaired by Prime Minister Narendra Modi gave its approval for introduction of two bills in Parliament to modify the list of Scheduled Tribes in five states - Assam, Chhattisgarh, Jharkhand, Tamil Nadu, Tripura - and identification of new communities in the Union Territory of Puducherry," Sharda Subba said. Two communities from Assam, five from Chattisgarh, two from Jharkhand, two from Tamil Nadu and one each from Tripura and Puducherry have been identified, the Trinamul leader said. "The Morcha is an ally of the BJP but there was not a mention of a single community from the hills. 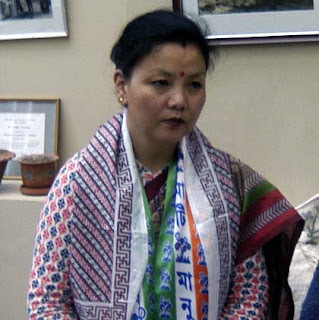 This clearly proves that both the Morcha and the BJP are not sincere about the demand and are only using it as an election plan as municipal polls are due this year and GTA elections next year," Sharda Subba said. "While the people are being asked to come out to participate in rallies, serious work is not being done by the leaders of both the parties," she said. On April 2, when the model code of conduct was already in place in Bengal, the ministry of tribal affairs had issued an order constituting a committee to examine and recommend on the demand of granting tribal status to various Gorkha communities "living in Sikkim and other Gorkha dominated states and areas." Roopak Chaudhuri, deputy secretary, Union ministry for tribal affairs, in the order had stated: "It has been decided to constitute a committee headed by Shri Ashok Pal, Joint Secretary, Ministry of Tribal Affairs, to examine and recommend regarding granting of Scheduled Tribe Status to eleven communities, namely Bhujel, Gurung, Mangar, Newar, Jogi, Khas, Rai, Sunwar, Thami, Yakkha (Dewan) and Dhimal living in Sikkim and other Gorkha-dominated states and areas." The committee is to submit its recommendation on the matter to the ministry of tribal affairs within three months. Gorkha Janmukti Morcha today brought out a rally to press for the inclusion of 11 communities in the Scheduled Tribe list but Trinamul quickly alleged that the Morcha, along with the BJP, was playing with the sentiments of hill people.